Robert Howlett is today a largely forgotten figure in the history of photography, yet his portrait of Isambard Kingdom Brunel is one of the most famous photographs of the 19th century. It was made on location at a time when most formal portraiture was done in a studio and has been described as the first great environmental portrait. At the time the photograph was taken, 51-year-old Brunel was one of the most celebrated men of his age. He was known for landmark engineering projects such as the Great Western Railway, numerous bridges, tunnels, stations and dockyards, and groundbreaking steamships such as the SS Great Western and SS Great Britain. In 1854, work began on Brunel’s most audacious project to date, the SS Great Eastern or Leviathan. At 692ft (211m) long, she was by far the largest ship ever built at that time and had the capacity to carry 4,000 passengers. In November 1857, as a result of the great public interest in the project, Robert Howlett was commissioned to make documentary photographs of the ship under construction at the Millwall Shipyard in London. These images were to be used as the basis for a series of engravings to be published in The Illustrated Times. Working in partnership with Joseph Cundall, he had also carried out commissions for Queen Victoria and Prince Albert. This work had included a series of portraits of Crimean War veterans in 1856 to mark the end of that conflict. Howlett used a heavy and cumbersome mahogany and brass camera that produced 11x8in glass negatives, which were made using the wet-plate collodion process. Invented by Frederick Scott Archer in 1851, the process involved coating a glass plate with light-sensitive chemicals. The plate was placed in the camera, exposed and then developed when still wet, and the whole process had to be completed within ten minutes to produce a successful image. This was particularly difficult to achieve when photographing on location as a range of portable darkroom equipment was needed. When photographing the Great Eastern, Howlett recorded at least one image of the deck as well as wider scenes of the ship’s construction. He used one conventional camera and another that allowed him to capture stereoscopic images. 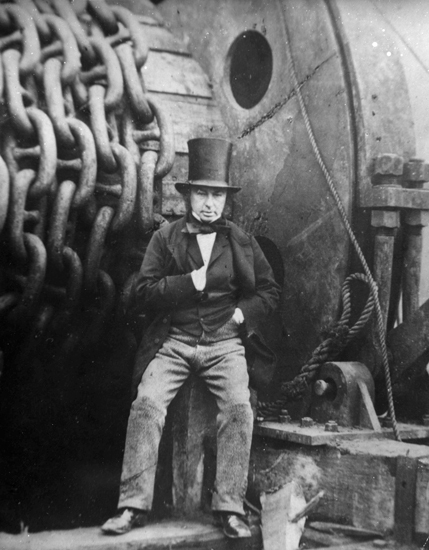 At least three of the photographs were full-length portraits of Brunel, including one that showed him sitting beside the launching chains. It has been noted by David White, himself a photographer and an admirer of Howlett’s work, that Howlett carefully fine-tuned Brunel’s pose until he achieved the final iconic image with the giant chains filling the background. In this image, Brunel looks to one side, puffing on a cigar. His expression is confident and determined, while his muddy trousers and boots indicate his hands-on approach in getting the job done. The strap across his chest is attached to a bag he habitually carried, containing a supply of cigars. Brunel’s stance has a heroic quality, while the chains serve to illustrate the huge scale of the ship he had created. This photograph became, in retrospect, the highlight of Howlett’s tragically short career. In 1858, he travelled to Rouen in France and tried out a new wideangle lens on his camera. After returning to his lodgings in Kensington, London, he told a friend that he had a bad cold. Three weeks later, on 2 December 1858, he died at the age of 27. His death certificate states that he died of ‘fever’ (possibly typhus fever, which was not uncommon in London at the time). However, some commentators have suggested that Howlett’s death was at least partly caused by close and prolonged contact with the toxic chemicals (including mercury and arsenic) that were then used in the wet-plate collodion process. The Great Eastern itself proved a huge disappointment. The project was plagued by financial problems, and the launch, initially watched by thousands of spectators, was delayed by three months. When she finally embarked on her maiden voyage, in September 1859, she was damaged by an explosion that killed several crew members. Brunel suffered a stroke just before the voyage and died ten days later, aged 53. The tragic early deaths of both Howlett and Brunel add a poignant footnote to a photograph that’s both the definitive portrait of a major figure in Britain’s Industrial Revolution and an image that symbolises the extraordinary achievements of the Victorian age. 1857: The United Kingdom and France declare war on China in the Second Opium War, which continues until 1860Charles Dickens publishes his third novel of the decade, Little Dorrit. Books: There are a number of good Brunel biographies available, including Brunel: The Man Who Built the World by Steven Brindle. Sadly, no books are available on the life and work of Robert Howlett. Websites: David White’s interesting account of Howlett’s work can be found on www.photohistories.com/Photo-Histories. More information on Howlett, and useful links to other websites, is available on www.wikipedia.com.